The Indian Market have seen many ups and downs in the last decade. There have been many predictions over the span of time. Some of which are based on one single thing “Whether Indian Capital Market will correct or collapse in 2018? This is the latest buzz of the town. 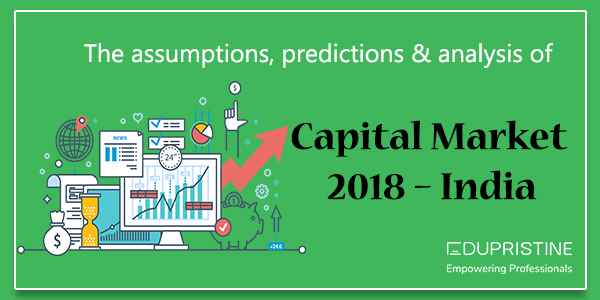 People are making capital market assumptions 2018 the latest topic form which no one can be recover. Well, the simple answer to all of this is that it is predicted that the Stock market will correct in 2018. You will be able to see the sudden rush in the market with such a huge impact. Nifty is moving at the level of 10,800+ and the Sensex trading is at the highest point of 35,000+ for all the time. Since the last year 2017 January, Nifty and Sensex are growing tremendously and with the jump of 7,500+ on Sensex and 2,400+ in Nifty in 12 months has increased the probability of the correction. Since August 2017, people have observed a rise in Nifty and Sensex as per capital market analyst. We will be able to see the correction soon in the year. However, we can’t be sure when it is going to change and what kind of changes we will be able to see in the near future. The correction has started to show its effect with the last records. Since it is clear that the changes in the market are going to happen now the next question that might be bugging you will be whether this change is minor or a big change? Well, according to the indicators, the correction will come under major category so it will be okay to say this is the best time for personal investment in the capital market to have profit. It is safe time to play the money game in different types of capital market. December 2007: This will be considered because the crash 2008 started during this time. Only in 14 months, the Sensex managed to crash 20,700 to 8,300 points. December 2010: During this time, Sensex started to recover after the cash with the points of 4500. Then the points started to fell down from 20,000 to 15,500 in the span of 13 months only. January 2015: With the total of 6000 points, the Sensex managed to correct itself and since then the 29,200 to 23,100 points fell in the Sensex in just 13 months. Here are the signs that will help in explaining the changes that will be experienced in 2018. According to the December 2007, this is the result that could be seen. Since 2004, there was no major correction in the Sensex ratio till the crash in 2008. However, the effects were seen since 2005 and it was the biggest runner that lasted for nearly 30 months. The alarm started to ring with the S&P BSE 500 index. It was easy to see the similar pattern in the stock market in recent time which is increasing consistently. Well, this static is the proof that the market will be correcting. In December 2010, Sensex rose at a good rate with the average of 20,500 points in total within 23 months only. It was understandable due to the recovery of the market from the biggest crash. However, in January 2015, the correction status was seen in this span as well. With all these, you will be able to see the hike in the upcoming year. According to the capital market theory, the average of 5000+ points will be seen in the year. Well, if we see the dividend yield capital market theory then you might feel the market will not be correcting in 2018. The dividend yield analysis of index bottom is done when the stock market peaks. In 2007 December, the dividend yield touched the mark of 0.76 which was very low with the Sensex of 0.85 only. This made India experience the biggest crash of all time. However, after the crash, the dividend yield rises to 1.15 in 2015 January to 1.21 in 2017 August with the Sensex of 1.15 and 1.23 respectively. These capital market examples onlyprove that correcting is still a long way down the road and it is possible that it won’t be seen in 2018. Another factor that predicted the correction in 2018 is just around the corner. It is proven that whenever the limits of P/E ratio is crossed, the capital market has whether seen a correction or have suffered a crash. P/E ratio of 2007 December was noted as 27.57 level which resulted in a market crash. However, in the year 2010 and 2015, it moves up to 20+ levels which created a buzz in the market. Well, the market was not in a good shape at that time too. But by August 2017, the Sensex was 23.82 with BSE 500 of 26.01. On comparing the entries, it can predict and even analyze that the correction will take place in the market sooner than expected. Then we will be able to see all the functions of the capital market soon. Missed signals are given by these analyses. Even with the capital market analyst salary, we don’t know what will happen next. The process of exact information will take time. Till then we can’t be sure whether you must invest in market or not. However, based on older theory and observation, everyone is expecting a correction in the future time. Previous How to understand and interpret cash flow statement?